This 25 liter EVA pouch with Velcro flaps and adjustable shoulder strap with soft pad was specially designed for the Rekola Motion Trolleys. The bag is waterproof and is an ideal extension to the trolleys capacity for storage of dirty mops and cloths used during the cleaning procedure. When full the pouch can easily be released from the trolley and carried to the laundry. The angled wide opening top guarantee easy access for dropping textile products in to the pouch. Because EVA is strong and very easy to clean the pouch can also be used for collecting bio-waste, bottles, cans or for transporting toilet rolls for distribution – all depending on the project to be cleaned and the capacity required on the trolley. There is a small window pocket on the front of the EVA pouch which can be used for color coding or identification of the trolleys location or user. Used in conjunction with utensils and trolleys to optimize the cleaning process. Suitable for any project inside and outside. EVA is resistant to most chemicals and can be disinfected. Rekola Addon EVA pouches add functionality and storage capacity to trolleys ,reduce trafficking between cleaning location and laundry and reduce trafficking during the cleaning process. EVA pouches are an ideal storage system for cloths and mops but also to collect bio-waste, bottles, cans and other waste. 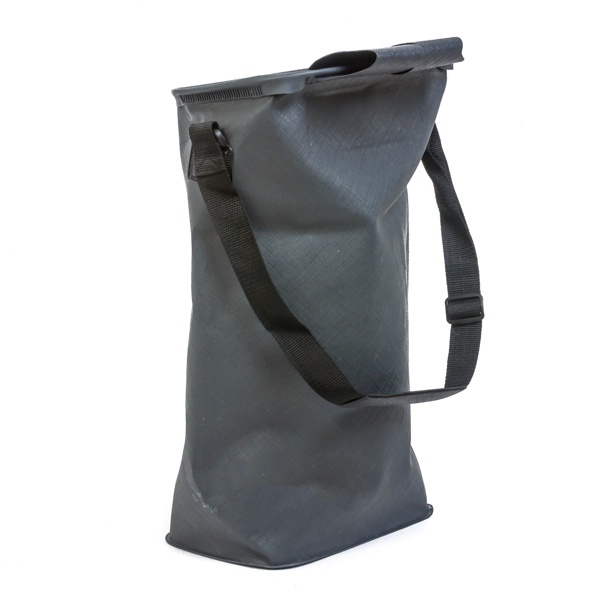 This EVA pouch is tested for carrying 20 kg static weight and is multifunctional and multi-purpose. The EVA pouch with Velcro can be simply attached to a trolley or machine by using the large EVA flap. Wrap it around a frame tube and secure with the Velcro straps. The Rekola AddOn EVA pouches are designed to customize and/or personalize the trolley specifically for the user. They can be removed from the trolley and carried with the 38mm Polyester shoulder strap with soft pad with cloths or mops to and from the laundry. There is a small window pocket on the front of the EVA pouch which can be used for color coding or identification of the trolleys location or user (e.g. AEN code card). The Rekola Addon mop bag reduces the trafficking between the cleaning location and the laundry area during the daily manual cleaning process. The adjustable Polyester shoulder strap with soft pad, guarantees the right carrying position when carrying the mop bag from trolley to laundry. The angle of the opening and the metal wire inside the border make it simple to drop the cloths or mops into the pouch. Polyester knitted 38 mm belt with adaptable by Polypropylene length adjusted. Polyester Velcro and Polypropylene belt extenders, inside the EVA welded border metal wire to hold the shape and opening.